Check whether the barcode is really missing. Enter your barcode into the Barcode box and hit the Check Barcode button. 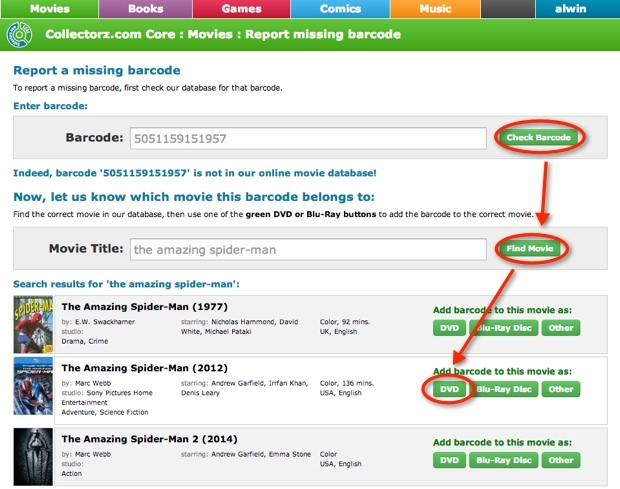 Now find the movie that your barcode belongs to. Enter the movie title into the Movie Title box and hit the Find Movie button. Use one of the green DVD or Blu-Ray buttons to add the barcode to the correct movie. That’s it! Your barcode will be added to our online movie database immediately, without intervention of our content managers. BTW: if you can’t find your movie in our online database, use the “Can’t find your movie?” section at the bottom to report a missing movie.